Inception Dance Theater held its premiere full-length concert, Ten to One, this past weekend, March 14–16, 2013, at the Langston Hughes Performing Arts Institute. Inception is the 2013 Resident Dance Performance Company at the newly-renovated LHPAI, which boasts a beautiful theater, and this partnership will surely be of benefit to both organizations. The contemporary ballet company, conceived just over a year ago, has ambitious goals to make dances that tell stories about the human experience, and to do so without limiting themselves to a particular dance background or style. They also seek a communal, shared consciousness as a group, a sentiment captured in the show’s title: Ten to One: Ten Dancers. One Company. Ten Hearts. One Soul. The small but warm crowd for the Friday evening show saw Inception take its first step toward reaching these goals with four very different dances. Artistic Director Christian Richards’ Grin opened the show with a short, joyous dance. Richards notes in the program that Grin is “purely a physical exercise, a representation of the technical movement styles” possessed by the company. As such, it was the only dance of the evening not centered around a narrative impulse. Instead, the dance used the whole space of the stage and house, beginning with a duet in the balcony and ending with the dancers applauding the audience as the lights came up in the house. Throughout the concert, but especially in this first piece, the company made use of the whole theater. They entered from and danced in the house; they used the hard back wall of the stage as a choreographic tool. Rob Deemer’s vibrant string music provided a strong partner to the dancers’ cartwheels, leaps, and turns. Jennifer Porter’s Other followed Grin with a much more serious tone. The piece explored bullying and the different ways people can be hurt and manipulated by others. In a series of group dances and duets, the performers menaced each other with their faces, pushed, kicked, and restrained each other. The movement stayed firmly within the realm of contemporary ballet, and at times the gestures associated with bullying moments seemed layered on top of the dance movement rather than fully integrated into the choreography. Overall, however, the piece successfully conveyed a sense of both the physical and psychological violence that comes from bullying. While the first two dances featured women in pointe shoes, Diptych veered away from classicism with both soft shoes and bare feet. 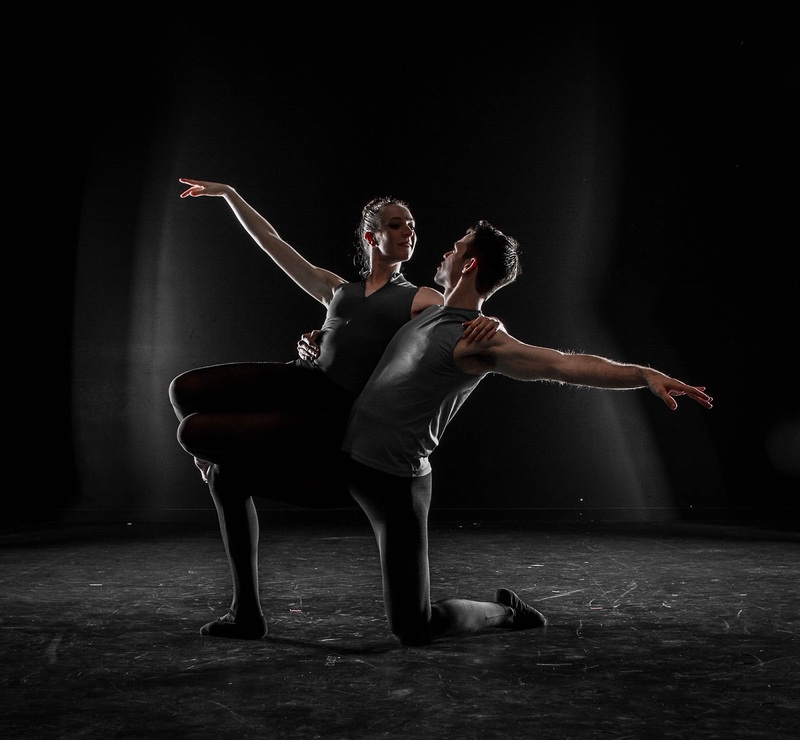 Choreographed by company dancer Joshua D. Deininger and with another gorgeous score by Deemer, Diptych delved into different kinds of romantic relationships, from the joyously carefree and sensual, to the casually careless, to the painfully troubled. The evening’s standout performances were in this piece, including a sensual duet by Elizabeth Voiles and Julian Young in the first movement, and a precise and emotional duet danced by Mireya Mascarello and Deininger in the second. As in Other, the thematic gestures—here chiefly embraces—sometimes felt overly literal and merely layered on top of dance movement, but there were moments that showed more nuanced choreography. In the final duet, while Mascarello and Deininger were struggling with each other, an ensemble danced behind them in unison with abstracted gestures of embrace that carried through the whole body’s choreography, including facial expressions. The contrast between the couple’s frantic partnering and the group’s simple, repetitious unison was stark, and suggested the inevitability of strife in human relationships. This stood out as a moment where Inception’s goal of making work about human experience was very clear. The show’s finale was a jazzy little story ballet called Two Hearts, choreographed by Richards and set to music by Sandy Graham, Melba Liston, and Twilight Trio. The atmosphere was very 1940s, and the story followed the budding relationship between the miserable Showgirl (Emily Rookstool), under the control of the Tyrannical Club Owner (Deininger) and Hope (Rachel Gonsalves), girlfriend of the Maitre D’ (Sean Calavan). The piece’s opening number featured the full company as different characters in the jazz club, and their energetic ensemble dancing paired with a rendition of the 1940s classic “In the Mood” lent a bright and snappy start to the story. After a power struggle with the Owner, the romance between Showgirl and Hope came to fruition in a final duet. Seen directly after Diptych, the embrace motif here felt a little tired, but was sincerely meant. The light and airy quality of their dancing broke from the jazziness of the rest of the piece as a fitting illustration of their feelings. Ten to One was a solid first endeavor for a new company—they are a diverse group of technically capable dancers who have room to grow as performers and as a cohesive ensemble, and this gives audiences plenty to look forward to. It is exciting to see a contemporary dance company with a balletic vocabulary tackle narrative work and focus on tough subjects like bullying, as well as a pleasing range of romantic relationships. At its core, Inception is a company with a soul. They yearn to make work that is fully human, and this drive, this ambition will give them a boost in whatever they do next.